Lynn Araujo has been a publishing professional for over twenty-five years, and has worked at U.S. Games Systems since 2004. She did her graduate studies in Linguistics at Berkeley and was a Fulbright scholar in Indonesia. 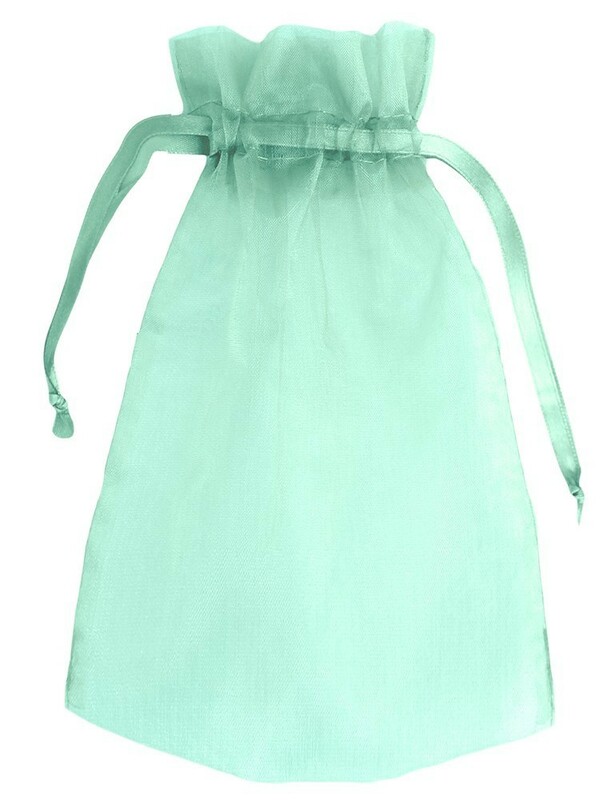 She has a passion for nature, gardening, cooking, travel and books. She lives in Black Rock, Connecticut where she finds inspiration for her writing projects. Pierre-Joseph Redouté was born to a Flemish family of decorative painters. As a young man he went to Paris, where he began painting the flowers of the royal gardens. His detailed etchings caught the attention of botanists who taught him more about the anatomy of plants and artists who introduced him to a new watercolor technique for illustrating flowers. Marie Antoinette hired Redouté to decorate the walls of her château. By the late 1790s Redouté had become the most famous and sought after flower painter in Europe. Empress Josephine invited him to come to Château de Malmaison to paint the flowers in her magnificent garden, which held over 200 varieties of roses. Between 1817 and 1824 Redouté published a three-volume collection of his rose paintings called Les Rose, his most famous publication. 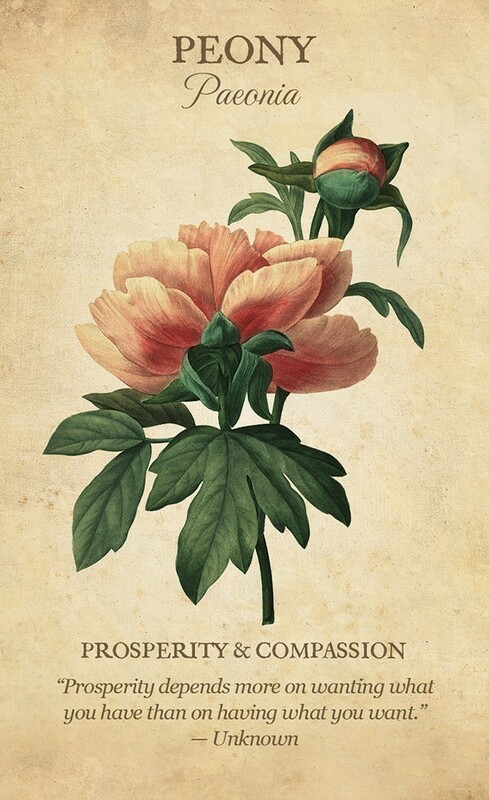 Since roses were Redouté’s trademark, we have included four of his rose paintings in this Botanical Inspirations deck. Card Size 2.75" x 4.5", Box 3.25" x 5"
So many things to love about this deck and book set, it’s hard to know where to start – but I’m going to start with the packaging, which is superb. The top of the sturdy flip-top cardboard box features a lush collage of Pierre-Joseph Redouté’s Victorian flower art, including the dahlia, coreopsis, asters, forget-me-nots, and amaryllis, among others. This box is roomy enough for a perfect-bound guidebook with the same illustration on its cover, the deck of 44 cards, a trifold pamphlet listing keywords for all of the flowers shown on the cards, and an organza pouch the same shade of mint green as the box, booklet, pamphlet, and card backs. Also included is a card providing detailed information about Redouté, who was born in 1759 to a Flemish family of decorative painters. By the late 1790s, Redouté was the most famous and sought after flower painter in Europe. Card faces are a tan parchment color, an attractive background for the artwork. The cards do a beautiful job of combining science and sentiment. At the top, centered, is the common name of the flower, with the Latin name or alternative name centered immediately under that in flowery script. 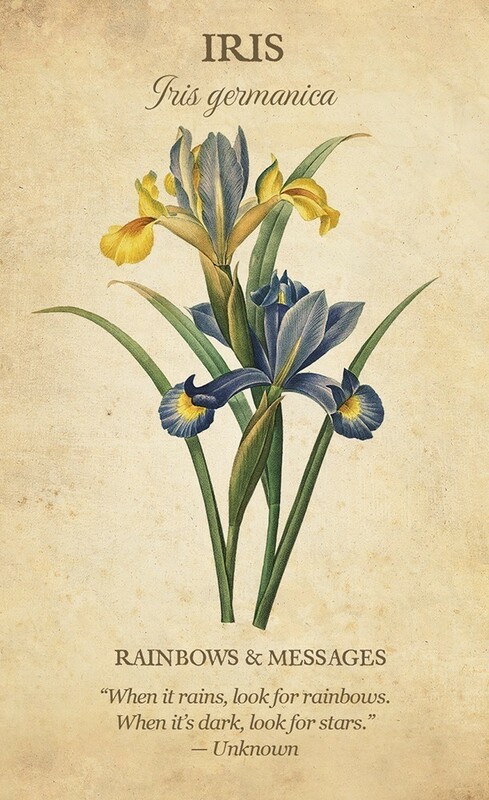 Next comes the Redouté’s illustration of the flower. The style is realistic, and it is easy to see how the artist was influenced by the botanist Charles Louis L'Héritier, who offered Redouté free access to his botanical library and plant collection. Centered below the artwork is the meaning attributed to that flower. Finally, also centered, we have a quotation that reflects that symbolism. 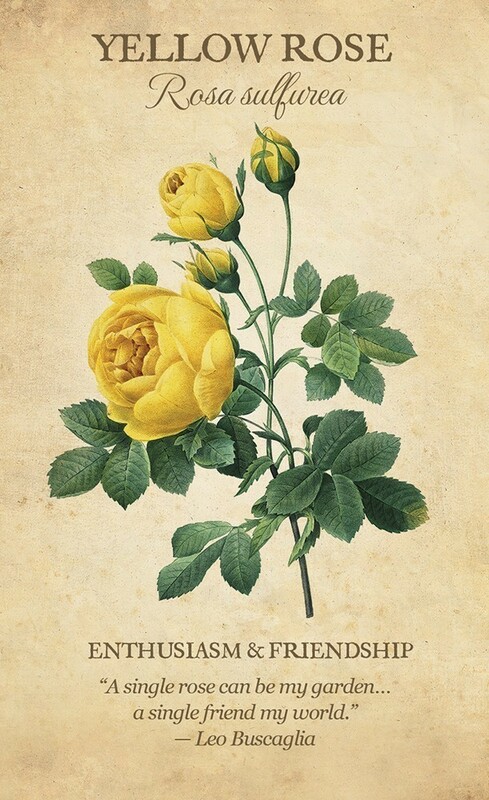 For each flower, the guidebook provides a black-and-white version of the Redouté illustration, the common name and Latin name for the flower, symbolism, quotation, a long paragraph discussing the flower and its meaning, and an Inspirational Message. The eloquent writing in the guidebook is a pleasure to read, offering tidbits of the fascinating history and cultural interpretations associated with each flower. The Botanical Inspirations cards are perfect for drawing a daily Affirmation, and the guidebook can be used as a resource when researching the various flowers and their meanings. The Botanical Inspirations Deck, by Lynn Araujo, comes beautifully packaged in a sturdy floral box with a lovely spring green deck bag. The deck and box set includes a Secret Language of Flowers fold-out reference guide that is a shortcut to understanding the secret meaning of the flowers. If you are an herbalist and gardener like myself, you will appreciate the simple beauty and vintage look and feel of this deck. The cardstock is substantial, but shuffles well and the cards have wonderfully rounded corners, which add to the luxury feel of this wonderful deck. The illustrator is Pierre-Joseph Redoute (1759-1840), and the pictures are classic illustrations that everyone can relate to in a reading. Who can resist the "Red Rose" which Lynn calls her card of Hidden Secrets. Red Roses have been given as a sign of romantic love as far back as antiquity. On the card, Ms. Araujo quotes Buddha with the phrase "Three things cannot be hidden, the sun, the moon, and the truth." No truer words have been spoken. It is said that romantic love is the elixir of the Gods and the card of the Red Rose when pulled speaks to our inner-longing to love and be loved without condition. 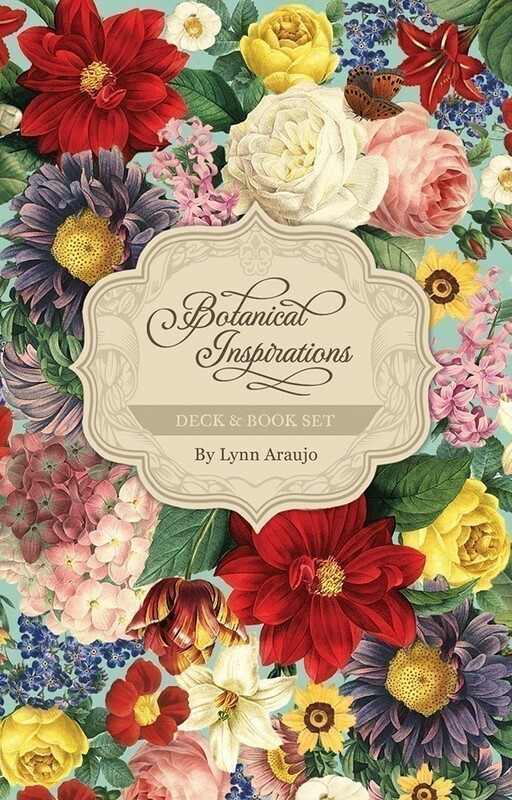 If you are looking for a beautiful and inspirational deck to begin your day with by pulling one flower out of the deck to meditate on then look no further than the Botanical Inspirations Deck, by Lynn Araujo, beautifully published by U.S. Games Systems, Inc.
Wow! It is beautiful with fantastic cardstock I love the box, booklet, pamphlet and bag that comes with it. It full of amazing flowers and quotes. I think all decks (Oracle, Tarot and Lenormand) should be made at this level of quality! I'm a professional Tarot consultant. My first word when I got this deck was, "WOW." The design is the very first thing that caught my eye. The artwork of Pierre-Joseph Redouté has had a long life due to the nature of his talent. He saw things and brought out details in flowers that no one else did. The box that comes with this deck puts me in mind of a miniature writing box from the Victorian era. It is a solidly constructed box too. There's even a small bag for the cards inside the box. The ribbon on the lid along with the lift-out ribbon makes the box a real stand-out. The cards themselves are quality. They have the images of the flowers against a cream background which enhances the antique effect. 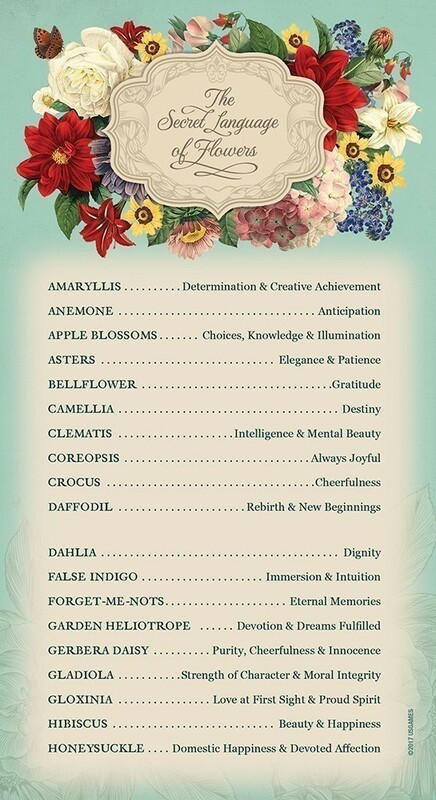 You get the name of the flower at the top with the Latin name beneath. At the bottom of the card, you are given a combination keyword + key phrase. Then the card is completed by a quote. 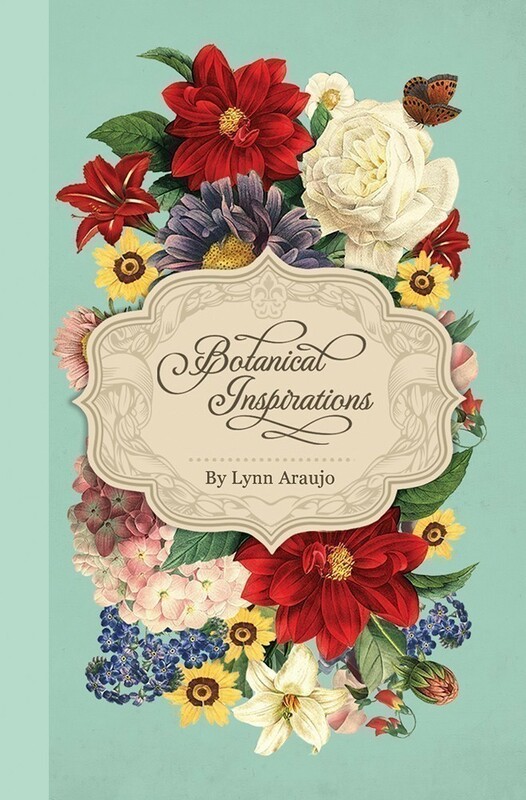 Author Lynn Araujo knows her flowers too. It is obvious that she is fluent in the language of flowers. I particularly liked that she didn't just stick to one cultural reference. Her knowledge has depth to it that sings through her writing. I would warmly recommend this deck. It may not be a major piece of art or a life changing investment like certain classic decks. But it’s definitely a lovely addition to any oracle collection. The packaging is of better quality than most decks I’ve recently bought. The cards are comforting both through their design and messages. And it’s a lovely escape from the seriousness of Tarot. If you want to draw a card that will inspire you without suddenly taking you some place uncomfortable (hello Devil, 5 of Cups or the Tower), then this is it. It’s a “safe” deck. One you can always turn to for a little cheering up and a little inspiration. The Botanical Inspirations deck published by U.S. Games is one of the most exquisite botanicals inspired decks I’ve ever come across. 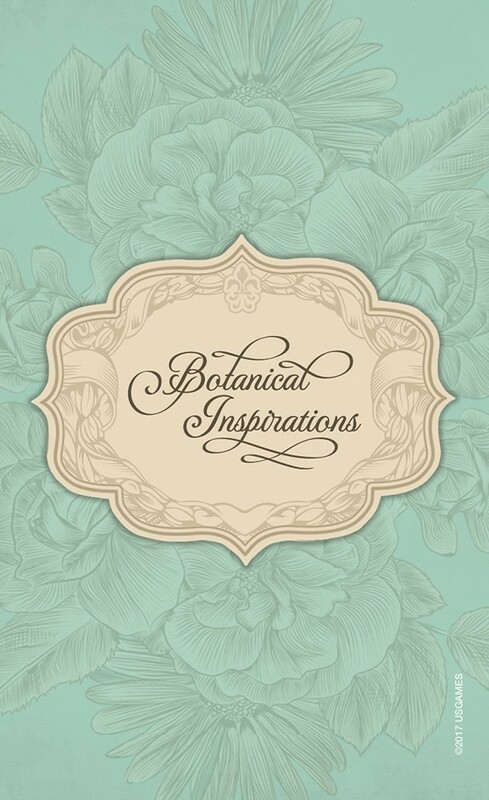 Botanical Inspirations is created by Lynn Araujo and the artwork is from the portfolio of painter and botanist Pierre-Joseph Redouté (1759 – 1840). What I love most, though, is the rich content contained in this beautiful box. The cards not only work as an oracle deck for divination, but also teach you the secret language of flowers, learning the symbolic and magical properties of each flower. A fold-out quick reference sheet provides easy-access information about the flower correspondences. For example, apple blossoms symbolize choices, knowledge, and illumination. Daffodils symbolize new beginnings. Red roses represent secrets. When sending a good friend of yours a thank you gift to express your gratitude, consider tulips. There is a total of 44 cards in this deck and on each card is featured the name of the flower in both English and its Latin nomenclature, what the flower symbolized during the Victorian Era, and a prophetic, inspirational quote that expresses the energy potential of the card. They’re great for your daily card-of-the-day draws and for divining motivational daily messages. 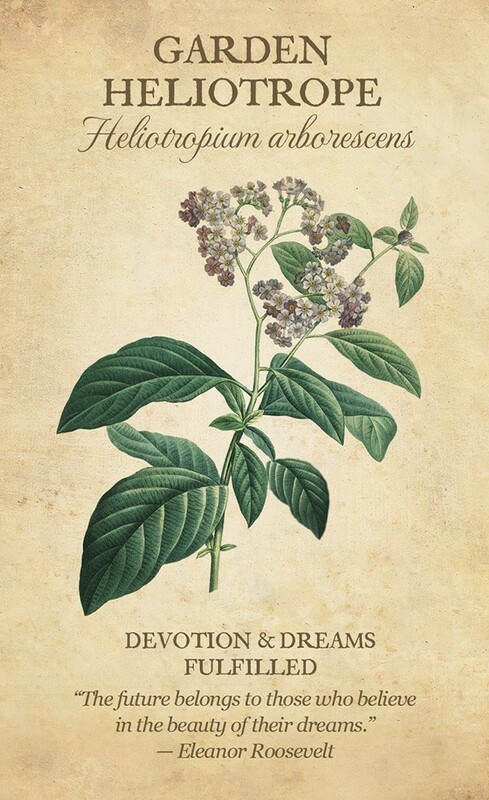 The accompanying guidebook is a wealth of information, providing history, lore, legend, and the religious or spiritual practices relating to each botanical. The entry for each card also comes with an inspirational message. The deck is a great resource for understanding floral language and how to use botanicals in your spiritual practices. I learned so much from this card deck I don’t even know where to begin. I love how much reference material is provided in this simple gift set. 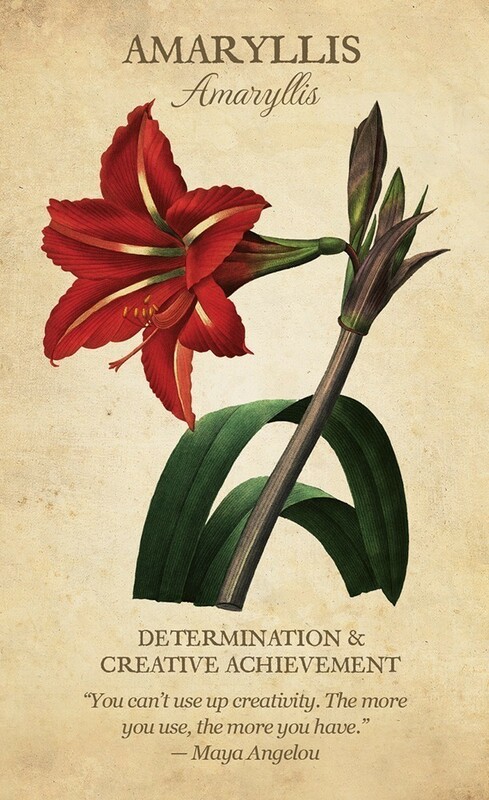 Full colour prints of illustrative paintings of 44 different flowers with the common name, Latin or other name, with keywords and a quotation. The booklet provides symbolism, flower lore, legend, hidden messages and affirmations. A Three-card reading and the Past, Present and Future reading is provided with examples. One card can be used for daily inspiration. Pick a card at random, look at the image and message. Close your eyes and meditate and make this image come alive. As it grows in your mind's eye, reach out your hand to feel its petals, put your face to the flower, feel its coolness on your brow, put it to your lips and feel its texture! Every day you choose a card, you will be given the gift of this flower until you choose another! If you love the Secret Language of the Flowers, you will find great treasures of beauty here!